All of this is happening at a terrible time for Goldman. It recently underwent a leadership transition, with longtime former CEO Lloyd Blankfein handing the reins to John Solomon, who is best known for moonlighting as an EDM DJ. Blankfein's former second-in-command, Gary Cohn, left the bank nearly two years ago to join the Trump Administration. And as the breadth of the scandal - and the likelihood that the bank's most senior employees may have looked the other way (though, to be sure, Blankfein has repeatedly denied having any knowledge of Goldman's role) - becomes increasingly apparent, the timing of Blankfein's exit is looking more and more suspect. 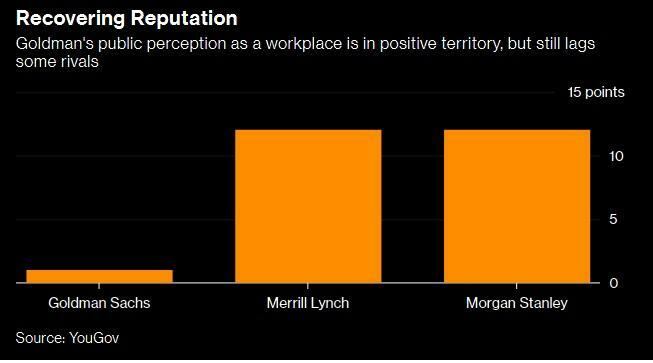 Public perception polling shows that Goldman has never quite managed to shake the "Vampire Squid" moniker that it earned during the financial crisis, according to Bloomberg. In a story published Sunday, Bloomberg released the most detailed account yet about the lengths that Leissner went to circumvent Goldman's compliance department in order to close on three successive bond issues underwritten by Goldman. The issues, totaling $6 billion, netted $600 million in fees for Goldman. To ensure that the deal would close, Leissner concealed the involvement of Jho Low, a Malaysian financier who was among the individuals charged by the DOJ on Thursday. In an effort to leverage Low's connections to Razak, Leissner tried to set Low up with an account at Goldman's vaunted private wealth division, but was again rebuffed by compliance officers in Switzerland and Singapore. Eventually, Goldman compliance teams from Europe to Africa, as well as the bank's global intelligence group, issued warnings about Low and cautioned that the bank should avoid taking him on as a client. But that didn't stop Leissner from inviting Low to a 2013 meeting at New York City's Time Warner Center, a meeting that also included Razak and an unidentified "senior Goldman official" - ignoring the bank's warnings about Low. Back in 2009, Leissner had leveraged his connections with Low to arrange his first meeting with Razak, a meeting that eventually helped him close on the 1MDB bond deal. At the time, Goldman and other US banks were digging out of the hole created by the financial crisis, and were desperate for business. Leissner tried everything to try and polish Low's reputation by finding a company for 1MDB to buy. Leissner also tried to convince Goldman to hire Razak's children for coveted Goldman internships in direct violation of a US law prohibiting banks from hiring relatives of senior foreign officials (JPM paid out a nine-figure penalty for violating this law back in 2016 during the so-called "princelings" scandal, where the bank hired the children of Chinese Communist Party officials). The type of plea agreement signed by Leissner, known as a "criminal information" suggests that he will likely cooperate with authorities. Federal prosecutors in Brooklyn, who are running the probe, likely have a broader view. Leissner’s admission of bribery and laundering conspiracy came in a document called a criminal information, which often suggests a cooperation deal with authorities. If that’s the case, Leissner could be a crucial guide for global investigations into how a majority of the $6.5 billion raised by Goldman Sachs, ostensibly to promote development in Malaysia, was allegedly diverted in one of the largest plunderings of public funds in history. And Goldman, which has said that it believed the money raised in the 1MDB bond offerings would be spent on development projects, last week put its former co-head of investment banking, Andrea Vella, on leave. The latest documents may mean Goldman Sachs’s reckoning over the 1MDB affair is far from over. On Thursday, the bank placed Andrea Vella, its former co-head of investment banking, on leave. Court documents unsealed earlier in the day said an unidentified Goldman official in Asia conspired with Leissner, Low and another then-Goldman banker, Roger Ng, and had knowledge that bribes were being paid. Prosecutors’ description of the official lines up with that of Vella, who couldn’t be reached for comment. But it's very possible that Vella might not be the final link in the chain. The sheer magnitude and complexity of the 1MDB fraud is staggering.While the Wall Street Journal helped break the story, perhaps the most detailed description of how the money was raised and diverted was published earlier this year by MalaysiaKini. In a multi-part story, its reporters explain how the money was fanned out across multiple shell companies and investments in other wealth funds. Ultimately, $700 million is believed to have been diverted into a personal slush fund accessible to Razak. The money trail illustrated in the charts below was gleaned from a DOJ lawsuit, as the DOJ has seized and sought to seize many of the assets that purchased by Low and others with money siphoned off the fund, including yachts, luxury homes and even box-office profits from the movie "The Wolf of Wall Street." To be sure, Goldman isn't the only bank to be tainted by 1MDB. Already, Singaporean authorities have frozen bank accounts, and shut down a tiny bank called Falcon Bank that helped shelter some of the money. They also arrested and charged the Swiss chief executive of Falcon, while fining Credit Suisse and UBS, among others. But in the US, at least, the focus lies squarely on Goldman. Expect more news, and possibly more indictments, to follow in the coming days and weeks.